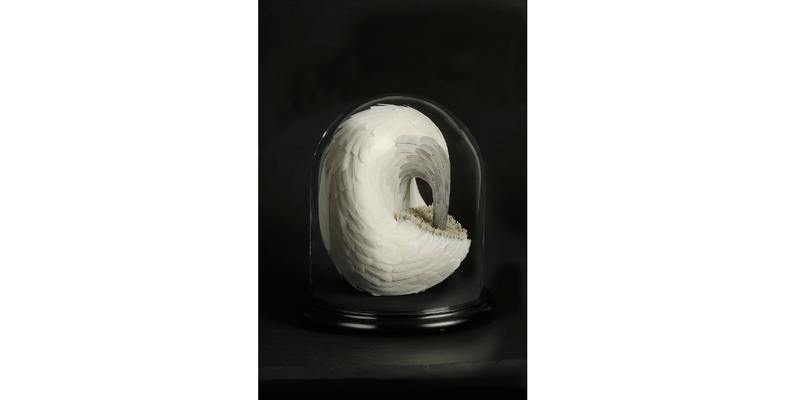 Galerie Huit is delighted to present the Hong Kong solo debut exhibition Secrete by British artist, Kate MccGwire. 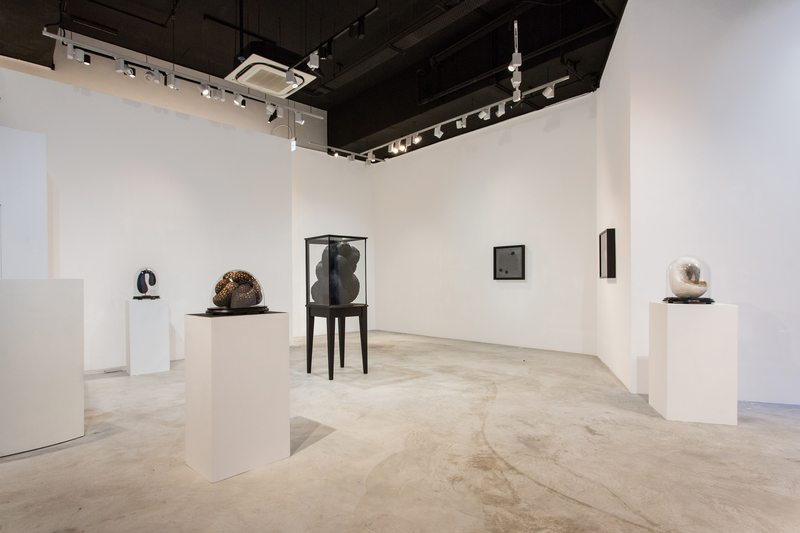 Galerie Huit is delighted to present the Hong Kong solo debut exhibition ’Secrete’ by British artist, Kate MccGwire. MccGwire (b. 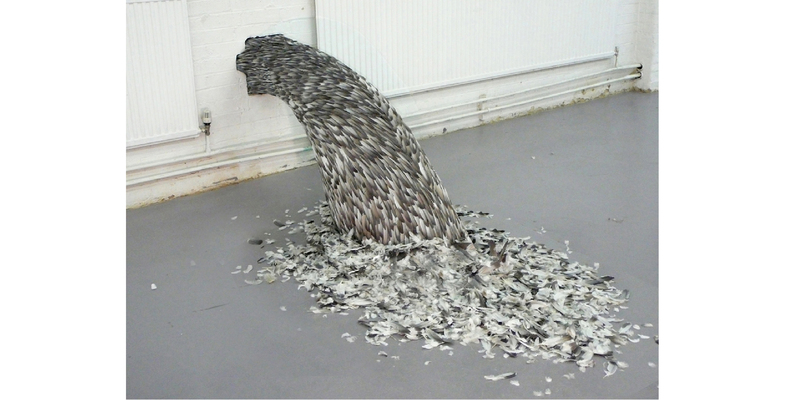 1964, Norfolk, UK) is internationally renowned for her distinctive anthropomorphic sculptures, wall pieces and dark graphite drawings – made primarily using the naturally discarded ephemera of birds; feathers, quills and bones, displaced from their point of origin, MccGwire re-configures the organic matter to present a new form of contemporary sculpture. 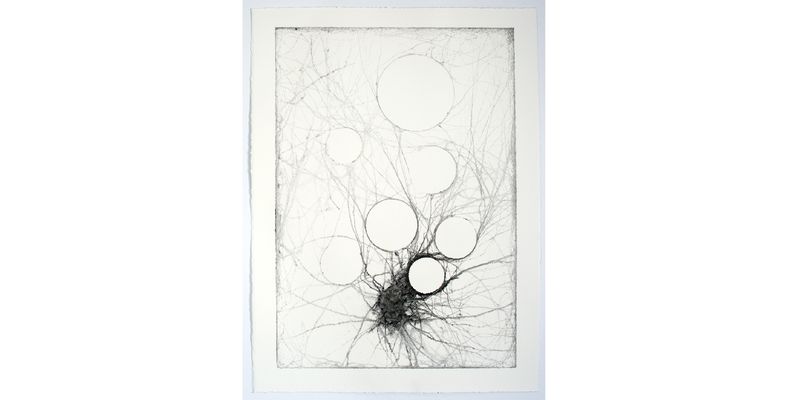 Employing natural materials, the artist explores the intrinsic value of organic beauty, via the play of opposites at an aesthetic, intellectual and visceral level. Since 2005, MccGwire has resided and worked on a barge moored on an island on the waterways of London, England. This parallels a key influence in her life – a childhood raised in the Norfolk Broads amongst a myriad of bird and marine life. The floating studio bears witness daily to the hierarchical order and fragility of the natural world and its surrounding eco-system. Such observations pose questions of a philosophical nature, some of which form the basis for recurring themes in the artist’s ongoing work. 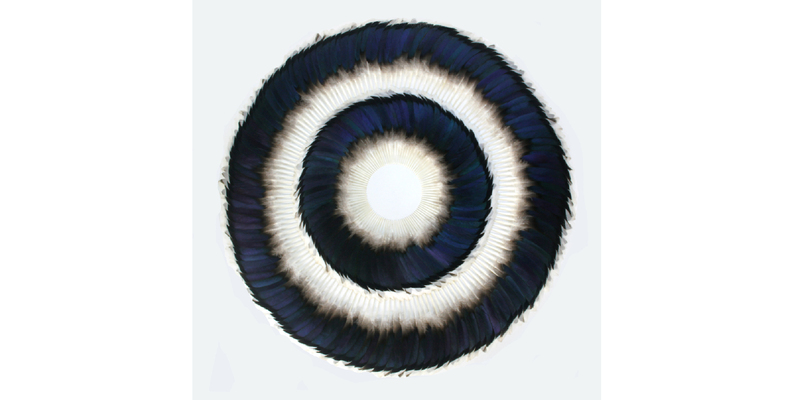 The varied assortment of organic detritus such as feathers that first fell near the boat captured the artist’s attention and the medium beckoned to her, and has done ever since. The distinct contours that twist and curve in MccGwire’s sculptural forms also refer to early experiences with her father, a boat builder who first taught the artist to make knots. The serpentine sculptures displayed in found antique cabinets mimic such strong and robust knots, yet their scale infers the majestic human representations of Greco Roman classical sculpture. The animal form and human scale present a hybrid of both the nature and man combined. 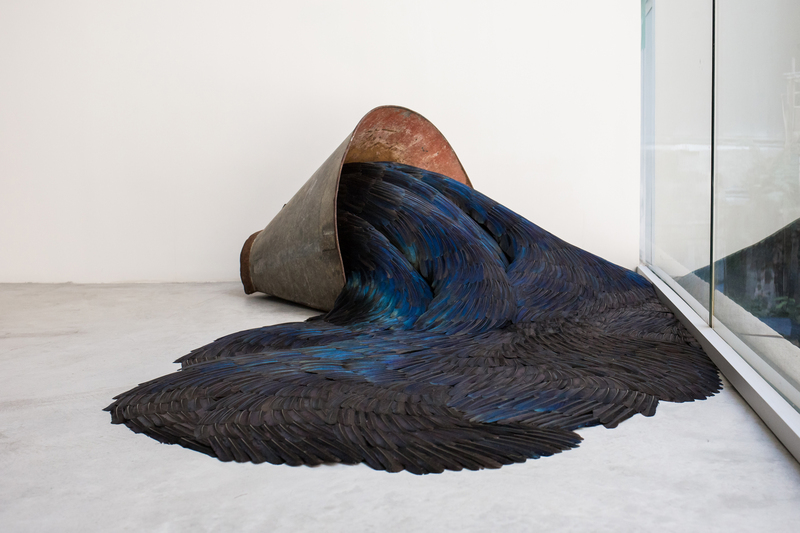 Where the artist’s hand painstakingly attaches hundreds of feathers to the sculpted armature, alchemy asserts itself, suggesting a transformation of the mundane to the majestic and unique. 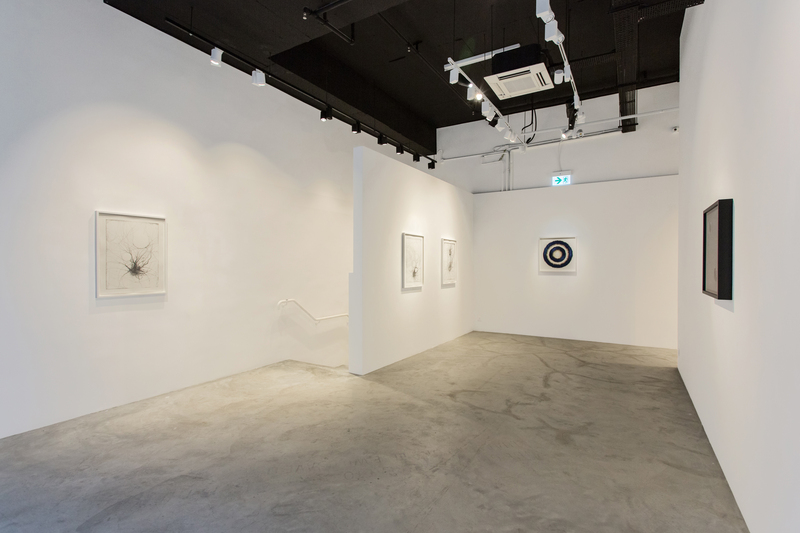 ‘Secrete’ the exhibition, comprises a comprehensive body of work, including seminal early site-specific installations, and new and recent mixed media sculptures, wall pieces and drawings never before exhibited in Hong Kong. Recently exhibited at the Musee de la Chasse, Paris, the mixed media installation of the same title ‘Secrete’, originally commissioned by the Hastings Coastal Currents festival, comprises a steel bucket that is tipped on its side with the contents spilling outwards onto the floor. 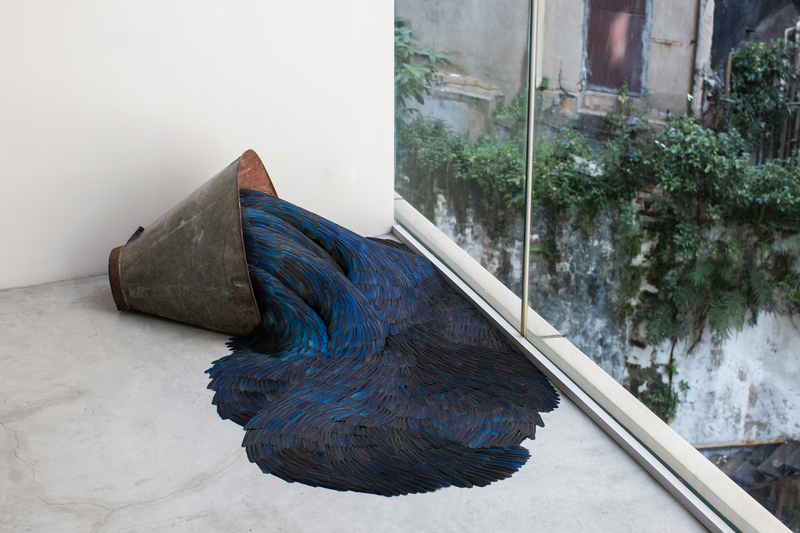 The forming puddle consists of blue magpie feathers that shimmer in natural light. In another part of the gallery, previously exhibited at the Archeological Institute, Athens and the Hydra Museum, Greece, the seminal site-specific piece with the onomatopoeic title ‘Heave’ gushes out from the wall with no visible beginning. Both installations depict a surreal narrative. Free-standing pieces such as ‘Flail’, ‘Orchis’, ‘Introvert’, that intertwine inside their glass cabinets and domes, are at once precious and caged. The human proportions in ‘Flail’ seem at odds with the antique vitrine it has been pressed within. In contrast ‘Orchis’, ‘Introvert’ and ‘Scylla’ presented in glass domes appear more intimate and intense. By definition, the word ‘secrete’ describes two opposite actions – to generate and release or to hide and conceal. Such duality is ever present in McGwire’s work, either demonstrated through the clever juxtaposition of scale or marriage of hard and soft materials. Through re-cycling the antique and re-purposing natural materials, MccGwire’s distinctive hybrids connect the past to the present, placing a new definition of abstract sculpture at the centre. ‘Secrete’ opens on the 27th October 2016 and runs through to 9th December 2016.